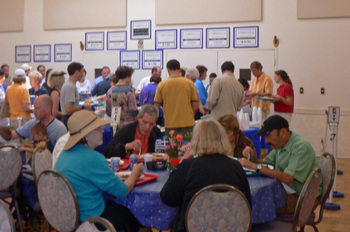 St. Spyridon's Greek Festival 2006 - mmm-yoso!!! 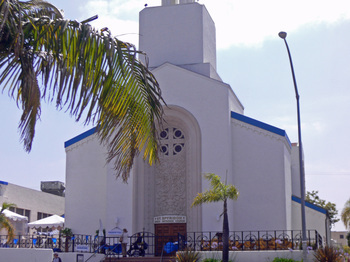 Since we moved to San Diego in 2001, we've been to the Greek Festival at St. Spyridon's Greek Orthodox Church every year except one. Though we had a pretty full schedule this year, we wanted to make sure to drop by, and get a few of our "favorites". 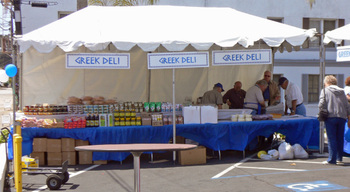 The Greek Festival at St. Spyridon's on Park Boulevard has got to be one of the most well organized festivals in San Diego. Everything from parking with a free shuttle service (At Roosevelt Jr HS - Upas and Richmond St), to traffic control and crosswalk safety officers are covered. I guess it's the experience garnered from many years(this is the 37th annual festival). The $2 admission is a mere pittance to pay for attending such an organized festival. 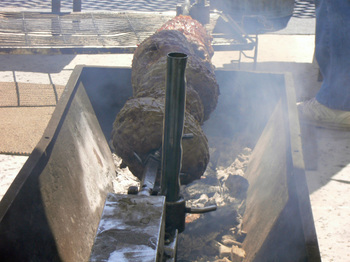 Arriving at 1115 this morning, my mouth was watering, as I checked out the lamb roasting. If you checked out my post on last year's festival, you'd know that I adore the Leg of Lamb Plate($6.00). Unfortunately, all the planets were not aligned this year, and we found that the lamb was not ready and that it would be an hour wait for it. Due to scheduling conflicts we wouldn't be able to wait around for it. Bummer! 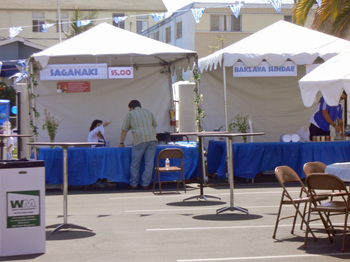 The Saganaki booth is by far the festive at the festival. 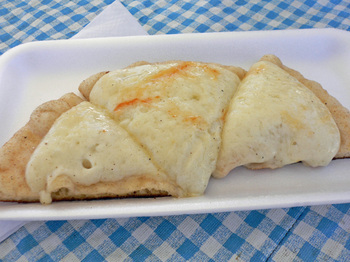 The cheese concoction is gooey, milky, and a bit on the salty side. This booth got very busy, very quickly. Not a bad Gyros Pita. While I was stuffing my face, the Missus made a quick trip to the pastry section. For those desiring a more refined dining experience, the Dining Room opens at 1130, with such items as Greek Chicken, Lamb Chops, Moussaka, Spanakopita, and other yummy items. Don't forget to stop by the Deli area as well. In case you weren't able to drop by today, you'll still have another chance tomorrow, Sunday, June 11th(from 11am - 9pm). The only strange incident that happened on our visit(other then the lamb not being ready), was a Husky Guy wearing a Pink T-Shirt peddling Mary Kay cosmetics, with Two other Women. They accosted the Missus twice, very strange. Thanks for posting this tonight, Kirk. I'm always disappointed when you post about some great food festival a week after it's done. We will definitely be there tomorrow; I remember wanting to go last summer when we lived in the neighborhood. Mmmmmmm - roast lamb. Are you sure it is the Missus that he was going after? Guy who wear pink t-shirt generally going after other man. Husky or not!!!. 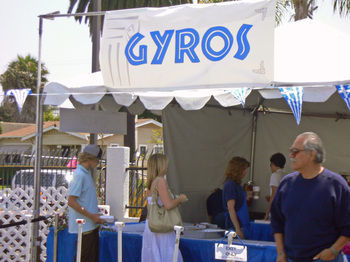 Glad to hear the Greek Festival is so fun. My husband and I are planning to go today(Sunday) but since we've never been to it we didn't quite know what to expect. Thanks for the heads up! When you have a chance, try this one, I guarrantee you'll like it. 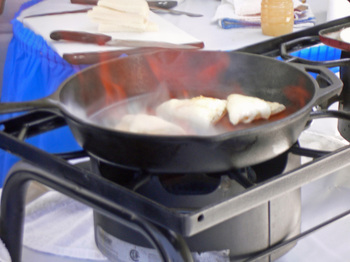 saganaki is flaming haloumi cheese. man, is that good stuff! Hi JosephE - I kind of realized that, so I made sure to post last night. Hi Beach - I love the sashimi at Sushi Gen....you really do get your money's worth in terms of quality and quantity. You know, I'm not really that good at this blogging thing....I'm just me. 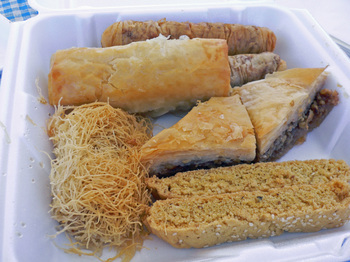 Hi Lynnea - The Greek Festival, is fun, and a good way of stocking up on all those pastries. It is not cheap, especially if you eat in the dining room, all those lamb chops and chicken can add up to a hefty amount, and elf control when it comes to those pastries is difficult as well. Hey Dave - THanks for the info - the sign at the festival said it was some kind of cheese that started with a 'K' and was 12 letter long, and the Lady at the Saganaki booth could hardly pronuonce it Herself! But who cares, it tasted good! We made it to the festival today, and the lamb was ready for us. I can't recall the last time I've had lamb roasted so well. The flavor was full and the portions were generous for $6 a plate. We decided to give up on taking any pastries home, and ate them while listening to the Greek band. I see no reason to let those elves get their grubby mits on them. you are right, it isn't cheap to sample many different foods at the festival =) But it is all so tasty! We really enjoyed the Greek Sausages. They had orange peel in them and maybe Nutmeg? We brought home a container of pastries as well. It is just too tempting as you walk away from the festival to get one last bit of deliciousness for the road. Another comment, sorry for the barage of them, but I just read your comment that you might put up a coming events section on your side bar. That is a fantastic idea!! Not too far in advance, but like a weeks notice of events would be good. Could the name of the mystery cheese be "kefalatori"? Oh no! I didn't see this post until tonight. I would have LOVED to have gone today. Sigh. You even had the saganaki (which I still haven't had)and those baklava, etc. look so good! Oh, you're truly killing me. (sob) I'm going to cry myself to sleep now. Hi JosephE - LOL! We need to control the "inner elf". The roasted lamb is probably the item that they do best. Hi Lynnea - Thanks for your input. I'll try and see what I cn cook up with regards to an upcoming events calendar thing-a-majig. Hi Ed - Thanks, that sounds about right. Very milky-salty cheese - very tasty. Hi Kady - So sorry, I'll have to really try to do an upcoming events thing. We were out of town when this festival was taking place, so I'm glad that I at least got to experience it through your post! 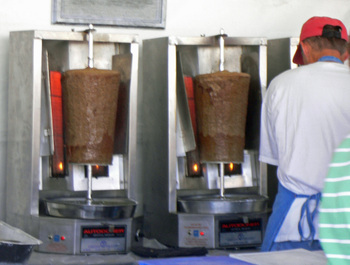 I love Greek food, so I'll definitely have to keep an eye out for it next year! 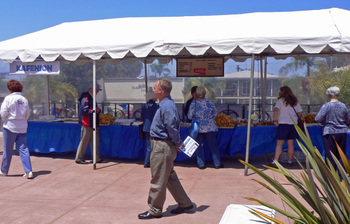 Hi Joan - It's one of the better organized festivals in San Diego....plus that roasted lamb is really good. Hi DrK - I'll make sure to introduce myself next year. No need for "extra special care", just the great lamb is reward enough! I stumbled across your blog while I was doing some online research. Festivals such as you described are so wonderful in that they encourage diversity and expose people to foods they might not otherwise get the chance to sample! Hi Bill - Yes, you are right, these wonderful festivals expose us to different cultures and food.